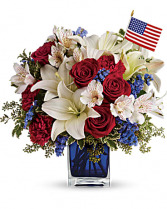 A patriotic pick to send a brave veteran, decorate your Fourth of July picnic, or celebrate Memorial Day. Honor them by sending this cheery Oh Happy Day! 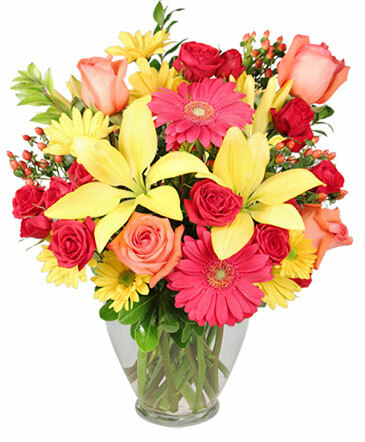 bouquet of gerberas, lilies, delphinium and other bright seasonal flowers from All In Bloom! You may call us to send flowers or order flowers online anytime, day or night! 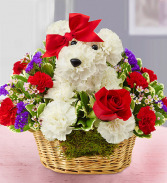 All In Bloom in Las Vegas has floral arrangements and gifts perfect for any special occasion, but sometimes you don't need a reason to remind someone you care. That's why we think "just because" is one of the best reasons to say: "Thank you," "I'm sorry," "I love you," "Hope you're having a good day," "Good luck," "Congratulations," "I miss you," "I wish I could be there," or "Forgive me." Browse our selection and order online or call us to place an order "just because!"